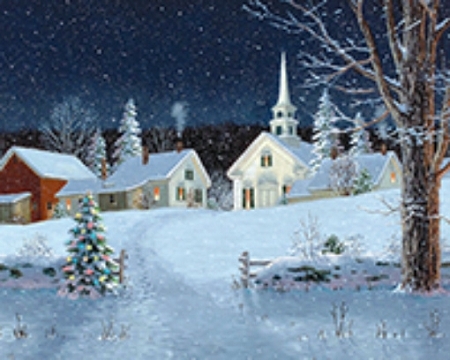 Imagine Christmas Eve in a small New England town, a light snow falling over the surrounding mountains. Footsteps in the new snow cut a path from the colorfully decorated tree to the church above, warmly lit to welcome the faithful. Another wonderful painting by Fred Swan for this 1,000 piece puzzle. 24" x 30"